Winston Churchill, a name synonymous with World War II, cigars, and the occasional Doctor Who episode. I realized when I picked up this book that I didn’t know much else about him. I’ve visited Westminster Abbey and seen the memorial stone (he’s buried elsewhere) and I’ve seen the statue in Parliament Square. But these sights didn’t conjure up much beyond his role in WWII. 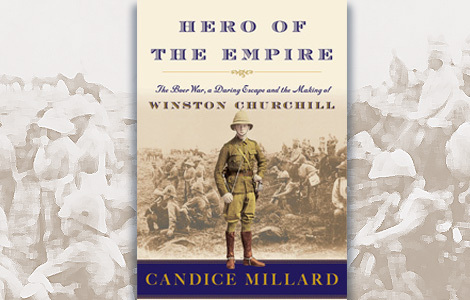 So, when I saw Candice Millard’s book, subtitled “The Boer War, a Daring Escape and the Making of Winston Churchill,” I thought I needed to check that out. There are a great many books about Churchill; I could have chosen from more than a few. But I really enjoyed a previous book by this author called The River of Doubt, about Theodore Roosevelt’s journey through the Amazon. She has a narrative style that avoids being too much of a dry run through history and focuses on very specific events important to her subject. Winston Churchill’s exploits in South Africa during the Boer war seemed like the perfect vehicle for her style of storytelling. Hero of the Empire isn’t a straightforward adventure story, though. The author gets to the heart of why these events were so important to Churchill, and even to England, by asking the questions of who Churchill was at this point in his young life, and why he ended up in South Africa in the first place – why he wanted so desperately to be there. She asks what it meant to the people immediately surrounding him, including the Boers themselves, and what it meant to a whole country. It’s this perspective that gives the story its impetus, propelling it forward with meaning and not just as a re-counting of a series of events. If that sounds like it’s dry where I claimed it wasn’t, readers can rest assured that author answers these questions by showing, not by telling. She goes through Churchill’s adventures in India, and his attempt at politics after leaving the army and eventually going to South Africa as a war correspondent. Through all of it he is headstrong and sometimes incredibly arrogant. He can also be an elitist, privileged snob. These traits defined his actions, which I found fascinating, and help to build the author’s case and lend dimension to a legendary figure. I can’t say enough about Candace Millard’s writing. The book is evenly paced, informative, and exciting. If you want to dig deep into the minutiae of Churchill’s life, you won’t find it here. Don’t let me mislead you, you’ll get a lot, including details about the Boers and their impact on South Africa, but it’s all events in service of the overarching story. There is lengthy bibliography at the end demonstrating the author’s in-depth research. But I found her judicious use of the material a huge plus. One more thing, if you’ve been willing to read this far. Despite the fact that this isn’t a “What teens are reading now” novel, I think book would be excellent for the high school age. See, no matter how much Churchill wanted to shape his own destiny, he always found himself at the mercy of everyone around him. The more control he sought, the less he had. Few events were of his making. Yet, he never stops doing everything he can to get to that place he believes he should be. That belief in himself drives him from one moment to the next. You would think that would be worth something. Did I mention that Winston Churchill is memorialized in Westminster Abbey? Yes. You did mention that Winston Churchill is memorialised in Westminster Abbey. What you did not mention is that Churchill inspired a nation and an Empire when it stood alone amidst the setbacks of Dunkirk and the devastations of the Blitz, ultimately prevailing against Nazi tyrrany alongside our American friends and cousins, who joined us after Pearl Harbour. I know because I was born in 1943 and was one of those babies thrust into the air-raid shelters on the sound of the warning sirens. To my parents and their contemporaries Churchill was more than a hero. He was a saviour. It is to him we owe those freedoms we all take for granted. It is noteworthy that within months of becoming Prime Minister in 1940 he survived the serious threats of two no-confidence votes in the House of Commons in 1942. Had he not he would have been stripped of office. How soon the World forgets! Call the omissions minutiae of his life if you like. Nor do you mention whether the book spoke of his house, Chartwell, some twenty miles South of London in the Kent countryside, a favoutite destination of tourists. There you can savour the wide views over The Weald, scene of much of the Battle of Britain, absorb the character of this complex man, some of his paintings (he never threw away the duds) and the brick wall he built with his own hands. You saw the statue in Parliament Square, there is also a statue on the Green in Westerham, the small town near Chartwell. Dis you miss the informal sculpture of Franklin D. Roosevelt and Churchill together on a bench in Bond Street? We all know his flaws – as we should our own. Perhaps I have underestimated your knowledge and focused on a topic outside the subject of the book. If so, please forgive me, but his Boer War exploits cannot be fully appreciated without the perspective of the Second World War. Richard, thanks for reading my review! You are right, the understanding of Churchill, the times he lived in, and the impact he had are a much larger discussion (especially for an American like me, who is far removed from the subject). This book focuses almost solely on the one specific event of his capture during the Boer war. There is some history of his personal life leading up to that moment, but very little beyond it. I have not had the opportunity to explore much of the UK beyond the standard sites of London. I would like to get back one day and delve into the real history. A most generous response to my ungenerous reply.